A few weekends ago our family jumped in the car and headed to Normandy for a long weekend. I will provide additional details on the trip in future entries, as it was one of my favourite trips that we have taken in the last 2 years. 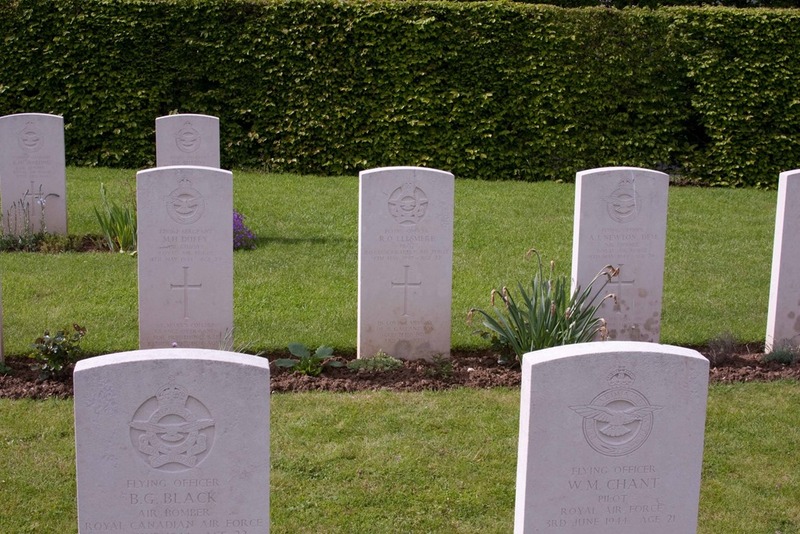 A big part of the trip was the goal of finding one of Narda’s relatives in the war cemetery near the D-Day landings. Veterans Affairs has done an amazing job through the Canada Remembers project of cataloguing where our war dead lay. I do not have immediate relatives who served in the Canadian forces during WWII as my family mostly moved from Holland in the 50’s. 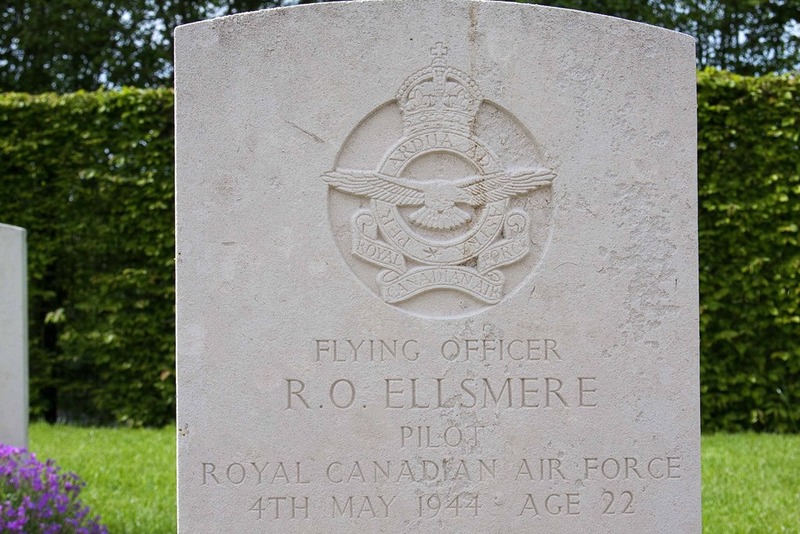 Ross Ellsmere served in the Air Force as a pilot and died a month before D-Day (probably on a bombing run). He is buried at St. Desir Cemetery, which is found after a long and winding drive through the French countryside. On the road we were lucky to see the small sign pointing down a side road, in the middle of nowhere. I wondered what it would be like. 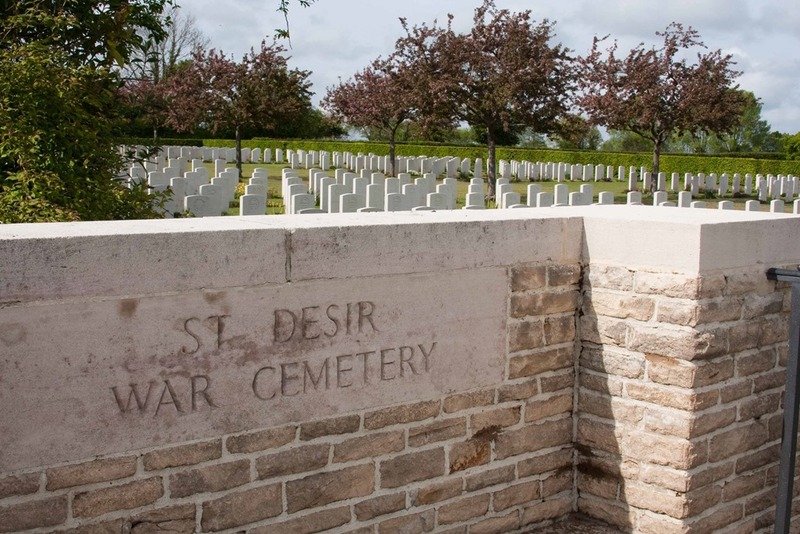 Situated just out side of the town of Lisieux, famed for the Basilica dedicated to St Therese is one of the smaller British Cemeteries. In all there are 598 graves here including 16 Canadian, 6 Australian, 1 New Zealand, 5 South African, and 1 American. When I stepped out of the car I was hit with two feelings. 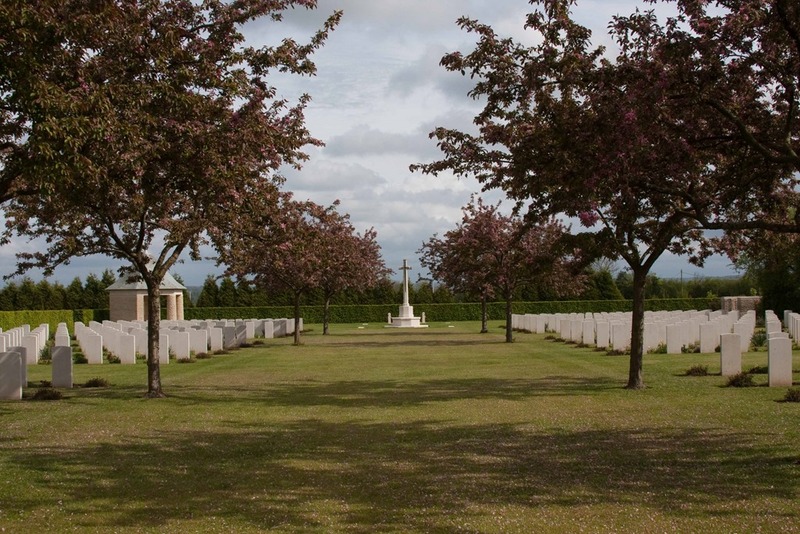 The first is pride, the cemetery is immaculate – pristine and beautiful. The government is taking care of our war heroes in the right way. The second is a sense of magnitude. This is a small cemetery (550), but the rows and rows of graves is humbling, a testament to the price that was paid for our freedom. The grave of Ross Ellsmere (22) is surrounded by men who died on the same day. It was a bloody day and you are struck by one thing – the age. Very few are older than 22 or 23. 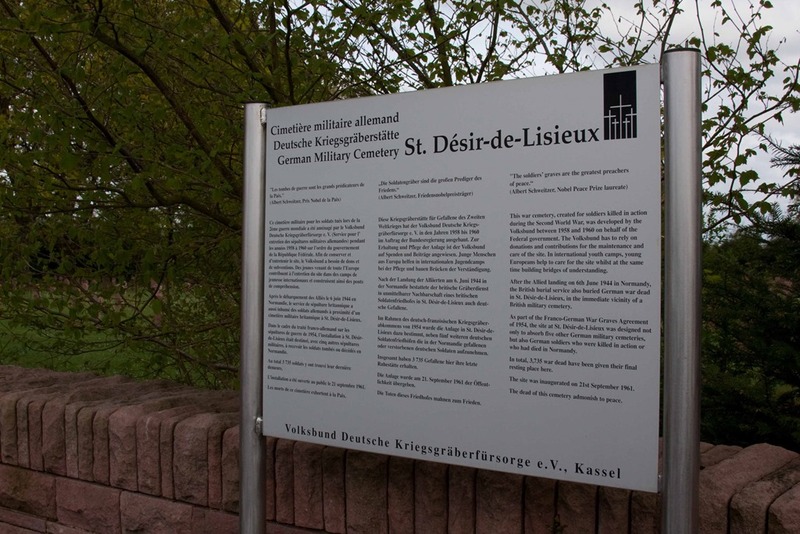 Right beside the cemetery is St. Desir-de-Lisieux, the German cemetery. 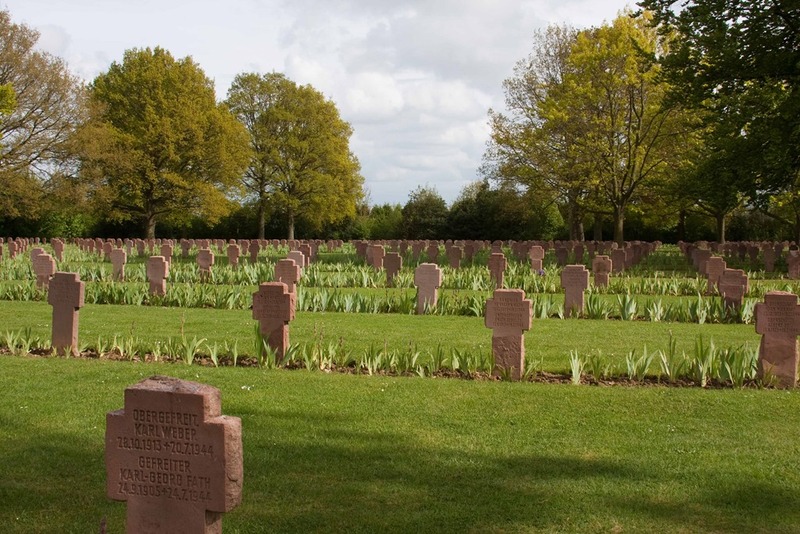 Unlike the Allied cemetery, there are no words on the graves written from loved ones. There is just name, rank, date. In fact, there are 2 men to each cross and as the picture shows, it is a very big cemetery – 3,735 to be exact. This entry was posted in Our UK Adventure, Travel and tagged Canada, France, Ross Ellsmere, St. Desir Cemetery, war cemetery, war memorial by michaelweening. Bookmark the permalink. I just ‘discovered’ your post about Ross Ellsmere. I am related to Ross. His Mother was my Grandmother’s (Eva) sister. I am interested to to know your interest and connection to Ross. As I mention in the post above, the relation is through my wife Narda, daughter to Lynn and Nick. I believe that Ross’ mother was a great Aunt. I met her a few times. While in Normandy we drove deep into the French countryside to find the cemetery. We almost turned back at one point as it was well out of the way, confusing to find (a not-well marked side road) and growing later in the day. I am glad we didn’t. Our entire family found it a humbling experience. Hi to all the relatives of the lost of war..Last week we drove back from a holiday in Spain and like you we spotted the sign for the cemetary,so with car and caravan we pulled off the road onto what could only be decribed as a country lane. We were there for a good hour and like you myself and my wife Sue felt very humbled,the cemetary is immaculate even in the cold of January it is still left stunningly beautiful,although my grandad lost his right leg in the 1st world war and survived,my father was too yound for the second ,,I am now 62 all our parents long gone but we still feel it is our duty whenever we are travelling through France to stop whenever we see a sign to pay our respects. God rest all the fallen buried in St Desir and all the other cemetaries of the world. 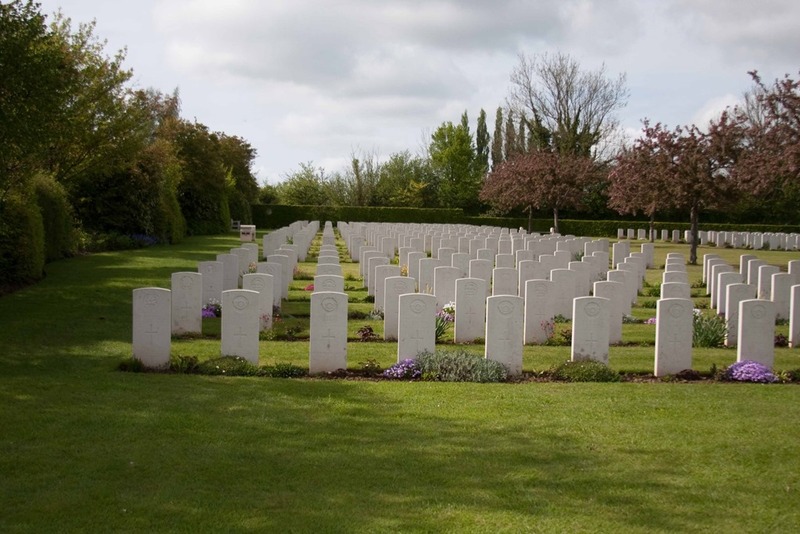 i too have an uncle in this cemetrey he was private francis english died on the 20th of aug 1944 age 21yrs is home town was bradford yks england i have visited is grave 3 times . Thanks for the note Mary. A wonderful way to remember him. Thanks for sharing, Michael. The rows and rows of graves must be overwhelming. You are welcome Lois. Indeed, it makes you thankful for their sacrifice.